Want to incorporate loops into your Samplitude Pro X2 projects? We show you how. Love them or loathe them, loops have become an integral part of modern music production. In this article, we’ll show you how you can import audio loops into Samplitude Pro X2 and sync them to the project tempo. Samplitude can handle loops in numerous formats, including its own Magix Soundpool loops, Apple Loops and Acid loops. Providing they have some kind of tempo information embedded into the file, there should be no problem. There is quite a good library of loops which comes with the install DVD or the download version, to get you up and running. Loops are imported into a Samplitude Pro X2 project from the file browser. To open the file browser, click on the Files tab to open the File Manager from the Docker. If the Docker is not showing, make sure Manager/docker is ticked in the View menu. Alternatively, you can open the File Manager from the same menu by choosing Manager / File Manager, or operating the default shortcut of Ctrl+Shift+B. When you open the Manager, the file path should default to Documents / MAGIX / Samplitude Pro X2. You’ll see there an icon named Sounds, which is a link to the Magix sample content. Double-click on this, and it will take you directly to the loop content which was installed with the program. This content consists of drums, percussion, effects loops and various instruments, divided into a wide selection of genres (I counted 26), which include two-step, ’60s soul, ’70s funk, ambient, reggae and chillout. Each genre has its own folder which is labelled with the original tempo in bpm. On import, loops can optionally be copied to the project folder and converted to WAV format. Before you carry on, it’s best to save the root folder destination, so go to the top right of the file browser, click on the small downward arrow and choose ‘Add current folder as favourite’. A dialogue will pop up, prefilled as ‘_Sounds’. Click OK, and now this destination will be saved as a favourite. If you have loops located on other hard drives, navigate to their locations and save them as favourites using the same method. At the top left of the File Manager is a text input box, where you can search for loops by name. Click the binocular icon to search. To the right of it is a ‘Play selected clip’ button, and next to that is a padlock Autoplay icon. When this padlock is enabled, any loop you click on will be auditioned automatically, with no need to press the play button (see main screen above). To the right of the padlock is a horizontal fader for adjusting the playback volume. Left-click and drag to adjust the volume, or use your mouse wheel to make adjustments. Holding down Shift while using the mouse wheel gives you a finer adjustment of the fader. Next to the fader is an icon for Looped Preview; when this is engaged, the loop will play back continuously. To stop playback, just press the space bar or click the ‘Play selected clip’ button. The BPM Sync button needs to be turned on in order to synchronise the loops to the tempo of the current project. Loop preview doesn’t take into account any effects which may be on the selected track; loops are previewed through the global play device which in most cases would be the first output pair of your sound device, usually designated as the main output of your master faders. Left–clicking on the cog icon gives you some extra options: ‘Show directory Tree’ toggles the visibility of the directory window at the left of the Manager; ‘Read format information of files’ shows or hides information such as length, resolution and sample rate in the browser header; and ‘Load options’ lets you choose what will happen when you import multiple files into the VIP. Options include ‘Use selection order of file dialogue’, ‘Load files in alphabetical order’, ‘Load all files to selected track’ and ‘Load files to different tracks’. Finally, ‘Extended file search’ allows you to refine your search using parameters such as date, length, sample rate, file name, project comments, description/title and originator/artist. To the right of the cog icon is a box labelled ‘All media’. Clicking on this opens a menu which allows you to filter the type of media you’re looking for. 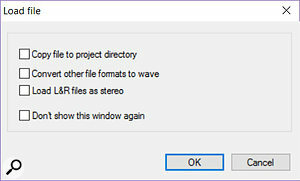 Options include Wave, MP3, QuickTime, Windows Media, FLAC, Ogg Vorbis, MIDI or All Media. Next to the ‘go to parent directory’ yellow arrow icon and the green ‘refresh’ icon there is also another box, which allows you to navigate to the different hard drives on your computer. To add a loop to the VIP, make sure the track you want to add it to is selected. You then have a choice of dragging and dropping the loop in the desired position, or placing the play cursor somewhere on the timeline and then double-clicking on the loop to place it in this location. You can also add the selected loop to the project by simply pressing Enter. Pressing Alt+Enter will add the loop to a newly created track and the track will be assigned the name of the loop. Loops can be extended for as long as needed, simply by clicking and dragging. 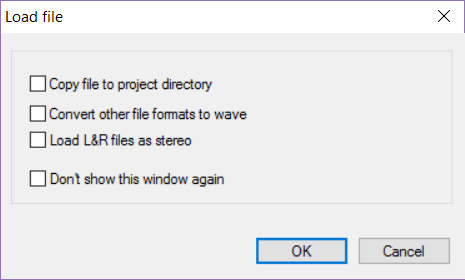 When you first add a loop, a ‘Load file’ dialogue will pop up giving you options to copy the loop file to the project directory, convert other file formats to WAV, and load non-interleaved L–R files as stereo. This dialogue can be turned off by ticking the ‘Don’t show this window again’ tick box. Once you’ve added a loop to the project, it can be made to repeat for as long as needed by grabbing the bottom right-hand corner and dragging to the right. If you want to disable repeats, right-click on the object and untick Build Loop Object (Ctrl+L). The object will then snap back to its original length. There is one small quirk of the loop browser worth noting. If you start with an empty project at one tempo — say the default 120bpm — and audition a loop at a different tempo, then as soon as you add the loop to the project, the tempo of the project will change to match the loop tempo. However, if you enable the metronome and begin playback as soon as you audition a loop, the opposite will happen: the loop will sync to the host tempo, so when you add that loop to the project it inherits the tempo of the project, just as it will if you add a loop to a project that already contains other material. If you decide you want to change the tempo of an otherwise empty project once a loop has been added, double-click on the tempo indicator on the Transport, type in the new tempo and press Enter (or choose one from the drop-down list). A Project Tempo Change dialogue box will then pop up. This box has options for both audio and MIDI. Make sure the ‘adapt Audio objects to the new tempo’ box is ticked. Upon clicking OK, the loop will be automatically adjusted to suit the new tempo. Time-stretching of loops uses the Elastique Pro algorithm, and if you open the Object Editor (Ctrl+O) and click on the Time/Pitch tab, you’ll able to see what adjustments have been made. Besides the File Manager, there is also a Soundpool Manager, offering some functionality derived from the Magix Music Maker product line. The Soundpool Manager is usually hidden by default, but can be added to the Manager tabs by clicking on the ‘+’ at the top right-hand corner of the docker and choosing ‘(+)Soundpool’ from the list. Click on the cog icon, and from the pop-up, choose ‘add styles’. Then navigate to the same file location addressed in the File Manager. Once the content has been added it will appear in the ‘styles’ column at the left. The Soundpool Manager. When a melodic loop is loaded, buttons appear allowing pitch-shifted versions of it to be selected. Unlike the File Manager, the Soundpool Manager has an extra column labelled Instruments, but it has only basic auditioning features; these can be used for previewing loops in a ‘one-shot’ fashion but there is no ‘looped preview’ option. It’s possible to add Soundpool loops to an existing project, and they will be adapted to the project tempo. Another distinctive feature of the Soundpool browser is the group of seven ‘harmony selection’ buttons, which are visible only when auditioning melodic loops such as vocals. Button one is the root key and buttons two to six will give you pitch-shifted versions of the original, which are handy for building up melodic phrases. Magix have a good selection of high-quality Soundpool loops, showcasing different styles, available from their web site (www.magix-audio.com/gb/soundpools/).